Savannah is packed full with history, from 100-year-old houses to significant landmarks. Whether you want to learn more about the southern city’s past or just want to marvel at the beautiful architecture, Savannah is a great place to visit. One of the many fantastic places to visit in the area is the First African Church Savannah. The Church not only has a fascinating story but is also a stunning building. Everyone will have a wonderful time, touring this beautiful church. 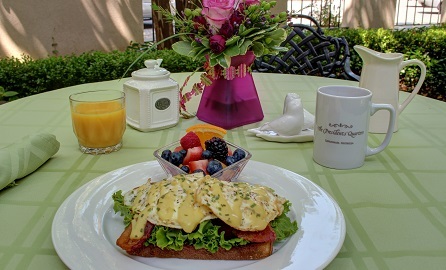 Here are a few things we, here at Presidents’ Quarters Inn, think you should know. 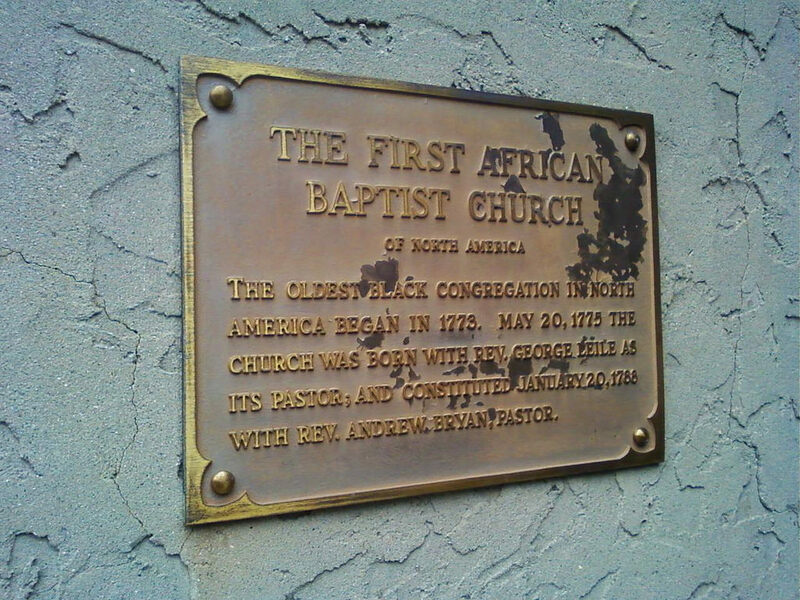 The First African Baptist Church Savannah goes back to the 1700’s. Reverend George Leile who organized the church in 1773 was ordained in 1775 as the pastor. In December of 1777 the church was officially constituted as a body of organized believers. Under the leadership of the third pastor. the pastor Reverend Andrew C. Marshall, the congregation later obtained the property, where the current sanctuary stands. Interestingly, Marshall helped put together the first black Sunday school in North America! 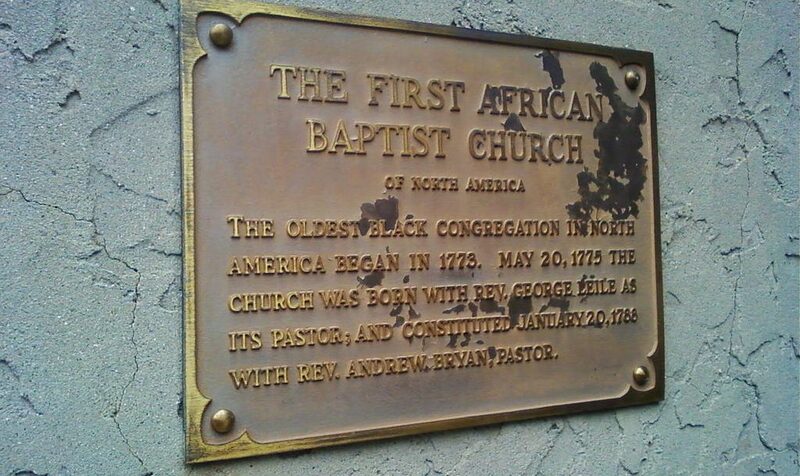 He also changed the name of the church from “First Colored Baptist” to “First African Baptist”. On the new property, the sanctuary was completed in 1859. Today, the sanctuary still contains many of the historical elements, allowing the congregation to preserve much of its rich history. From the stain glass windows to the old wooden pews, the church is kept in top-notch condition as it still maintains its heritage. The 1832 Pipe Organ, located in the back of the beautiful church, still to this day, creates incredible music. Take time to look at the stunning light fixtures hanging from the ceiling. The light fixtures were originally gas but were later converted to electricity. The pews in the main sanctuary were installed in the 1900’s; however, the pews in the balcony are original to the church. Made by slaves, the pews are nailed into the floors and have markings written on the sides in the African dialect known as “Cursive Hebrew”. As you are wandering through the church, make sure to look up at the beautiful ceiling. In the design of a “Nine Patch Quilt”, the ceiling showed that the church was a safe place for slaves to enter. The church’s main purpose was to create a safe haven for those in trouble or lost. Below the main floor of the sanctuary lies another subfloor know as the “Underground Railroad”. Many have looked, but no one has been successful in finding the entrance to the floor. The church offers an array of events from which you can choose. Take time to check out what is happening while you are visiting the area. Click here to see their calendar! 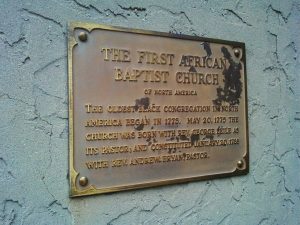 Savannah offers so much for visitors, and the First African Baptist Church Savannah is one of many things to do while you visit! 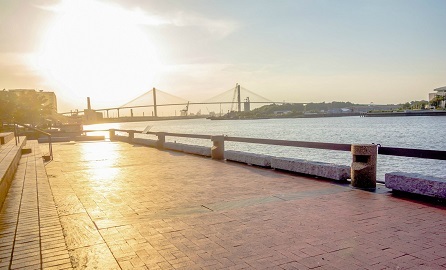 You can download a free copy of our Savannah Vacation Guide to learn about all of the other fun activities and beautiful views here in Savannah! As you are deciding where to go during your time in the area, make sure to check out The Presidents’ Quarters Inn. 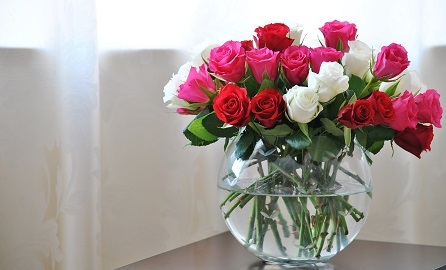 Offering a selection of lovely rooms and suites, you are sure to find one that fits your needs. 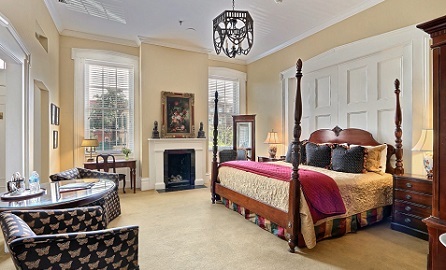 This charming bed and breakfast is a wonderful place in which to relax after visiting the First African Baptist Church Savannah. We can hardly wait to see you soon!